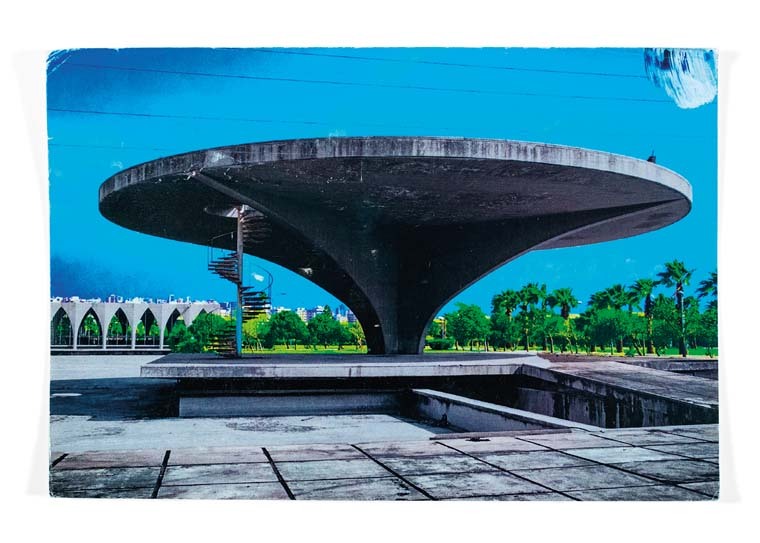 Caitlin Berrigan, Unfinished State postcard, 2010–13, helicopter pad at Rachid Karami International Fair Park by Oscar Niemeyer, 1967–75, Tripoli, Lebanon. Courtesy of Caitlin Berrigan and Archive Books. Narratives of city-branding and surges of global capital have caused waves of real estate development in Berlin and Beirut, two cities that were spatially divided by conflict and have been under reconstruction for decades. 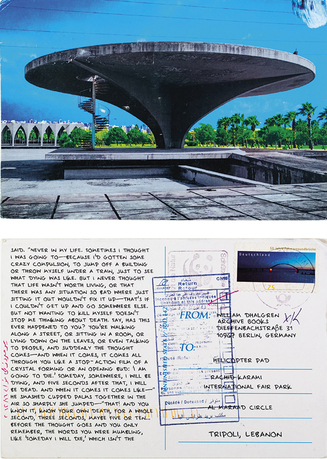 Caitlin Berrigan's artist's book strays from official narratives into a shadow landscape of unfinished and vacant structures that remain suspended in a state of incompletion—fixed on the brink of a possible future. 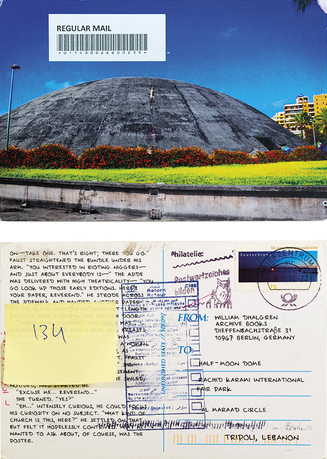 Berrigan transcribed a novel onto hundreds of saturated, photographic postcards as an epistolary exchange between Berlin and an emergent landscape of raw, concrete buildings across Lebanon. The ruptured, recompiled novel is accompanied by conversations with artists and architects on practice, social space, and real estate. 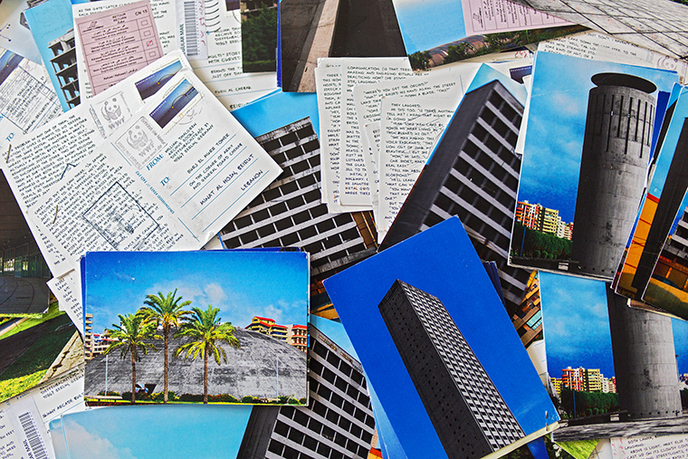 How do we carve out spaces for future imagination, that nonetheless acknowledge past history? Unfinished State explores how unfulfilled optimism, flows of capital, and shifting social terrains manifest across time through architecture and prismatic landscapes. Caitlin Berrigan works across performance, video, sculpture, text, and public choreographies to engage with the intimate and embodied dimensions of power, politics, and capitalism. She has created special commissions for the Whitney Museum of American Art, Harvard University’s Carpenter Center, and the deCordova Museum. 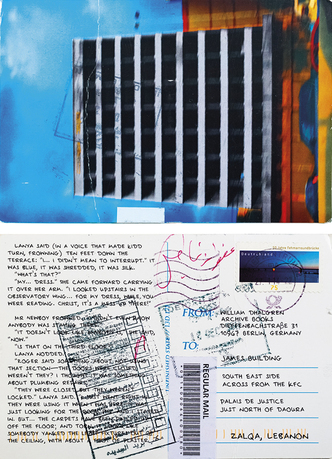 Her work has shown at Storefront for Art and Architecture, New York; the Hammer Museum, Los Angeles; Gallery 400, Chicago; Anthology Film Archives, New York; Los Angeles County Museum of Art; Lugar a Dudas Colombia, Cali, Colombia; 0047 Gallery, Oslo; and the Vancouver Olympics; among others. She has received fellowships and residencies from the Humboldt Foundation, the Skowhegan School of Painting and Sculpture, and PROGRAM for Art and Architecture Berlin, and is a 2015–17 Schloss Solitude Fellow. She holds a master's degree in visual art from MIT and a BA from Hampshire College, and teaches emerging media studio in the Department of Photo and Imaging at NYU’s Tisch School of the Arts.